Pediatric wheelchairs are less a category of wheelchair and more of a size group. Pediatric wheelchairs come in the same folding, rigid, reclining and tilting models that adult models do but are just smaller overall. Most children who require wheelchairs require the same features as adults and benefit equally to the wide range of options available. Where pediatric wheelchairs do differ from their adult counterparts is in their adjustability. Children, unlike adults, tend to grow and wheelchairs designed for them are designed to grow along with them, to a point. In fact some manufacturers offer the parts necessary to grow a childs wheelchair larger for free the first time they are needed after the original purchase. Seat widths for pediatric wheelchairs can range from about 10" to about 16" depending on the model chosen. Seat width is a little difficult to make adjustable on a wheelchair but there are some models with up to 3" of width adjustment. Unfortunately, when a wheelchair width is changed there is a more than even chance the seating system will have to be replaced which can be expensive i9n itself. Seat depths for heavy duty wheelchairs will range from about 8" to about 16" depending on the model chosen. Seat depths on pediatric wheelchairs is much easier to make adjustable than width and seating sytems are often designed to have some seat depth adjustability built into them. Seat heights on kids wheelchairs will range between 8" and 20" depending on the model chosen. Seat height for pediatric wheelchairs has a huge range and the reason for this is there are different trains of thought for choosing the correct seat height for kids. One train of thought is the child should be abel to transfer in and out of the wheelchair on their own which requires a low seat height, another train of thought is the child should be at eye level with their peers when seated which depending on their age may mean low or high and a third train of thought is the child should be at desk height for activities. None of these trains of thought are right or wrong and what the priorities are for each child will determine which seat height will be chosen. The back height of pediatric wheelchairs will be just about any height needed but generally be somewhere between 8" and 20". The back height requirement for each child will depend on the support needed but kids wheelchairs often have some sort of custom or modular back support that can be mounted at whatever height is needed. Where on adult wheelchairs the back canes tend to be just a little higher than the back upholstery or back support, on kids wheelchairs the back canes may be substantially higher to allow adults to push the wheelchair without bending over. On pediatric tilt wheelchairs, recliners and very low models even these taller back canes aren't sufficient for adults to push the chairs comfortably and strollers handles can be ordered. 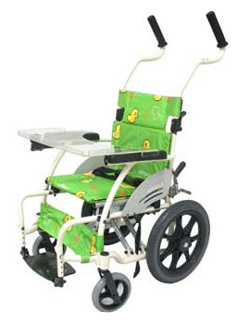 Stroller handles can be extensions that extend the height of the back canes or be full length handles that mount on the frame of the wheelchair and don't affect the back canes at all. I'm not going to talk much about frames because there are so many different types, sizes and styles but I will mention that the weight capacities wil be between 150 lbs. and 250 lbs. Children's wheelchairs have more options for rear wheels than adult wheelchairs and can range from 12" to 24" and have solid, air or air with solid inserts for tires. The front casters on kids wheelchairs start at 3" with solid tires but optional casters on at least one model are 5" solid. Axle plates are not common on heavy duty wheelchairs but there is at least one model that offers them as an option. Brakes for heavy duty wheelchairs are invariably conventional push to lock or pull to locak with several models offering brake extensions as options. Armrests can be full length or desk length, adjustable height or fixed height but normally will be removable. Heavy duty wheelchairs usually offer either 60° conventional footrests or elevating legrests but there are a couple of models which offer 70° or 80° versions.